Traditionally, every week we bring you a list of the top performances of Malians who are currently playing abroad. #1. 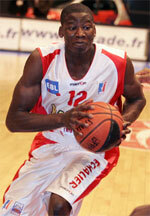 This week's number one is an international forward Cheick Soumaoro (204-90, currently plays in France). He led Saint-Quentin to a victory against the eighth-ranked ALS Basket (5-8) 90-76 in the French NM1 (third division) in Saturday night's game. Soumaoro had a double-double by scoring 12 points and getting 10 rebounds. He also added 2 blocks in 22 minutes on the court. Saint-Quentin Basket-Ball (12-1) is placed second in Group A. It was his team's fourth consecutive victory in a row. This year Soumaoro averages: 6.0ppg, 4.3rpg, 3FGP: 33.3% and FT: 84.6% in 13 games he played so far. He is currently a member of the Mali senior national team. #2. Second place goes to former U16 international power forward Cheick Diallo (206-96, college: Kansas, currently plays in NBA). 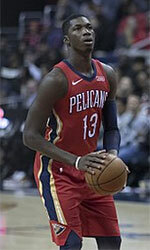 Diallo could not help the New Orleans Pelicans (15-15) to beat the Boston Celtics (17-10). He recorded 6 points and grabbed 7 rebounds. The New Orleans Pelicans (15-15) were defeated 113-100 on the road by the Celtics. Diallo's overall stats this season are: 3.8ppg, 3.9rpg, 2FGP: 57.1%(36-63). He played for the Mali U16 national team in 2011. #3. The Mali player who performed third best last week abroad was former U18 international forward Sagaba Konate (203-97, currently plays college basketball in the States). He contributed to W.Virginia's surprising victory against the University of Pittsburgh 69-59 in the NCAA in Saturday night's game. Konate scored 16 points, had 9 rebounds and made 7 blocks. The West Virginia University has conference record this season. Konate has relatively good stats this year: 13.6ppg, 8.0rpg, 1.4apg, 2.8bpg, 2FGP: 45.2%, 3FGP: 39.1% and FT: 81.3%. He played for the Mali U18 national team four years ago. #4. Center Boubacar Sidibe (205-94, currently plays in Spain) managed to help HLA Alicante to win against the tenth-ranked La Roda (4-9) crushing them 77-56 in the Spanish LEB Silver (third division) last Wednesday. He recorded 5 points. HLA Alicante (9-4) is placed second in East group. Sidibe's overall stats this season are: 2.8ppg and 2.6rpg. He used to play for the Mali national team last year. #5. International point guard Ibrahim Saounera (179-87, currently plays in France) was not able to help Lorient (9-5) in their last game on Friday. Despite his good performance the second-placed Lorient (9-5) was defeated 89-78 at home by the lower-ranked STB Le Havre (#6) in the Group B. Saounera recorded 13 points and added 4 assists. This season Saounera has relatively solid stats: 11.0ppg, 2.2rpg, 4.6apg and 1.3spg. He has a dual citizenship: Mali and French. Saounera plays currently for the Mali national team. #6. Forward Namory Boundy (202-89, currently plays in France) was not able to secure a victory for GET Vosges (3-10) in their game against SO Maritime Boulogne (7-6) in the French NM1 (third division), despite his very good performance in Friday night's game. He was the second best scorer with 14 points in 26 minutes. But GET Vosges (#13) was crushed 92-71 in Boulogne-sur-Mer by the much higher-ranked (#6) SO Maritime Boulogne in the Group A. Boundy has reliable stats this year: 10.2ppg, 2.8rpg, 1.6apg and 1.3spg in 13 games. He is a former international player as he played for the Mali senior team three years ago. #7. International power forward Baba Samake (200-94, currently plays in France) is a teammate of previously mentioned Ibrahim Saounera and both played together in the last French NM1 game. Samake couldn't help Lorient (9-5) in their game against STB Le Havre (5-5). He cannot count Friday's game as one of the best ones. Samake recorded only 2 points. Lorient (#2) was defeated 89-78 on their home court in Lorient by the lower-ranked STB Le Havre (#6) in the Group B. Samake's overall stats this season are: 4.5ppg and 4.6rpg. He used to play for the Mali national team last year. #8. Swingman Samba Balayera (195-96, currently plays in France) is a teammate of previously mentioned Namory Boundy and both played together in the last French NM1 game. Balayera couldn't help GET Vosges (3-10) in their game against SO Maritime Boulogne (7-6). He cannot count Friday's game as one of the best ones. Balayera recorded only 2 points in 13 minutes. GET Vosges (#13) was crushed 92-71 in Boulogne-sur-Mer by the much higher-ranked (#6) SO Maritime Boulogne in the Group A. This year Balayera's overall stats are: 7.3ppg and 2.0rpg in three games. He plays currently for the Mali national team. #1. Bandja Sy (204-F-90, agency: BeoBasket, college: N.Mexico St., currently plays in ABA League) contributed to Partizan's victory against the closely-ranked Igokea (4-6) 97-84 in the ABA League on Saturday night. Sy recorded 7 points in 22 minutes. BC Partizan NiS Beograd (5-5) is placed fifth in the ABA League. It's Sy's first season with the team. This year his overall stats are: 6.6ppg, 2.8rpg and 1.2apg in nine games he played so far. Sy has a dual citizenship: Mali and French. #2. Experienced Sidiki Kone (197-PF-1, currently plays in Serbia) led Partizan U19 to an easy victory against one of league's weakest teams Actavis Acad. U19 (1-8) crushing them 85-64 in the Serbian JLS (third division) last Saturday. Kone had a double-double by scoring 12 points and getting 11 rebounds in 20 minutes. BC Partizan NiS Beograd U19 team (8-0) is placed first in the JLS. So far his team won all eight games in the Regular Season. This year Kone's overall stats are: 9.3ppg, 8.0rpg and 1.4bpg in seven games. He is another player who holds two passports: French and Mali. #3. Amadou Sow (206-F-98, currently plays college basketball in the States) led UCSB to a victory against the University of Arkansas-Pine Bluff 55-45 in the NCAA on Saturday night. Sow recorded a double-double by scoring 12 points and getting 11 rebounds. He also added 3 blocks. The Univ. of California-Santa Barbara has conference record this season. Sow's overall stats this year are: 9.1ppg and 6.4rpg. #4. Tahirou Diabate (206-F-98, currently studies in the States) contributed to Portland's victory against the Sacramento State University 76-67 in the NCAA in Saturday night's game. He scored 8 points and blocked 3 blocks in 15 minutes. The University of Portland has conference record this season. This year Diabate's overall stats are: 6.6ppg and 3.4rpg in 11 games. #5. Nouhoum Bocoum (207-F/C-92, college: Arkansas St., currently plays in Spain) could not help Aridane (3-9) in their last game. Despite Bocoum's good performance the 15th-placed Aridane (3-9) was badly defeated 83-65 on the road by the higher-ranked (#10) Movistar Estudiantes Madrid B in the Group B. He scored 14 points and grabbed 6 rebounds in 24 minutes; quite an impressive performance considering it's only Bocoum's third season in pro basketball. It was Aridane's sixth consecutive loss in a row. It's Bocoum's first year with the team. He has individually a very good season with high stats. Bocoum averages: 15.8ppg, 10.3rpg and 1.8apg in 12 games. He has both American and Mali nationalities. #6. Salif Boudie (203-F-95, is currently at the American university) was not able to help the Arkansas St. in their game against the University of Minnesota in the NCAA. Boudie cannot count Saturday's game as one of the best ones. He scored only 3 points, had 7 rebounds and made 2 blocks. His team was badly defeated by 16 points 72-56. Boudie's overall stats this season are: 4.7ppg and 5.1rpg. #7. Bourama Sidibe (208-F-97, currently plays college basketball in the States) managed to help Syracuse University in a victory against the Georgetown University 72-71 in the NCAA last Saturday. He scored only 2 points in 6 minutes on the court. This year Sidibe's overall stats are: 3.2ppg and 3.9rpg in nine games. #8. Kassoum Yakwe (201-F-97, currently plays college basketball in the States) was not able to secure a victory for the Connecticut in their game against the Florida State University in the NCAA. Yakwe scored only 4 points, had 6 rebounds and made 2 blocks. His team was defeated 79-71. Yakwe's total stats this season are: 1.8ppg and 2.5rpg.